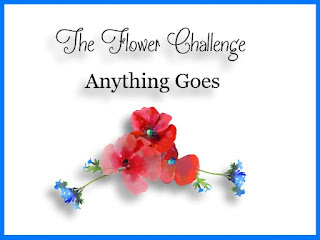 Hello everyone and welcome to THE FLOWER CHALLENGE #6. Thank you to all who participated in our challenge #5, where your entries CASEing the fabulous Therese Carvird were amazing. So this time our theme is Anything Goes, a very popular theme because it's you who decides everything about your card, just remember to make your FLOWERS your focal image. So, while I was thinking about what kind of card I was going to make, I decided to do what I seldom do and that is NO WATER COLORING at all. I confess it was hard, I feel that this is the medium I love the most but this time, I went totally outside my box and created this card, let me know what you think. This flowers were die cut with one of my absolute favorite Stampin' Up! sets, the Botanical Builder Framelits Dies, I love each and everyone of this flowers, they add fabulous dimension to your cards. All I did was to cut them in pink, yellow, black and blue card stock and build my flowers. I sponged some Ripe Persimmon and Barn Door distress inks in the center of the big flowers for some depth. The corner die cut was made with THIS Tim Holts Alterations die set. I couldn't resist adding a couple of sweet little bees to my panel, they are from a Power Poppy set called, Dynamic Duos: Foxglove and Ranunculus, I very, very carefully snipped this two little bees from the stamp to be able to place them anywhere I wanted. I put them in a little ziplock bag that is inside the big bag where I keep this stamp set, I would hate to loose them. 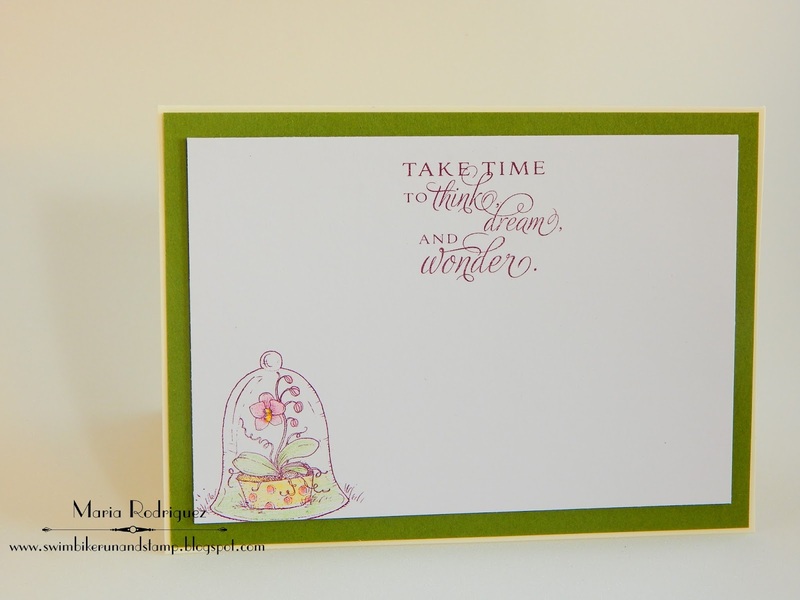 The sentiment is from an old Flourishes set called "Hydrangeas". 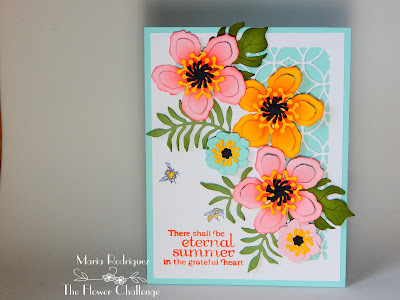 The sentiment is from an old retired stamp set from Flourishes called "Zinnias", I added another little flower from the same SU die set just to make this panel look pretty. I hope you are inspired to participate in The Flower Challenge #6, "Anything Goes", the sky is the limit, we can't wait to see what you create. For more inspiration, hop over the challenge blog HERE and visit my teammates blogs to see their gorgeous creations and leave them some comment love. Please display our banner when you submit your card to the gallery, here it is so you can copy and paste it on your blog post. Also, please take a minute to read our rules, they are few but important. 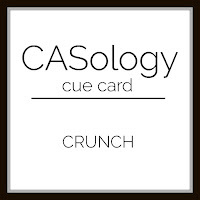 Hello everyone: CAS cards are still a bit out of my comfort zone, I never know if the ones I make are CAS enough for the challenges I participate in so, I kind of shy away from them but today, there is one over at CASology and the theme is CRUNCH, I immediately thought of sweet, red delicious apples and that is why I made this card. I took a cue from Jen, her blog is JENerally Speaking and she is one of the DT members and she explained to "Use your sentiment to ground an image....." and that is just what I did. This image and sentiment are from an old and retired Flourishes stamp set called "Apple of my Eye", I stamped them onto a die cut panel of Ninah Solar White card stock with Stazon black ink and colored it with my Prismacolor pencils and paper stumps dipped in baby oil. I tried to keep the inside CAS too. Both the sentiment and the little mug are from this same set. Cards und More Challenge #179 "Friendship"
Ike's World Challenges #83 "Anything Goes/optional twist "use a sentiment"
Through the Craft Room "Anything Goes"
Crafting from the Heart Challenge #148 "Anything Goes"
Hello and welcome to challenge #57 at RETRO RUBBER. 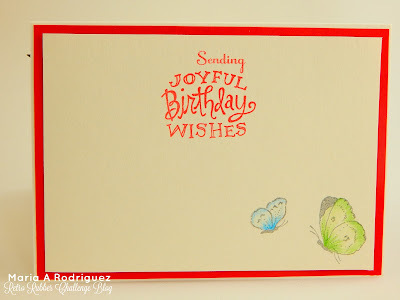 As you can see, this one is all about this colors and we want you to make your cards using them. My card was made using a super cute stamp set from Penny Black called Fairy Sweet, which I've own for over 4 years, I adore this little baby Fairies, here is my card. I stamped the image onto a panel of Strathmore mixed media paper with Stazon black ink and colored it with SU markers and an aqua painter, I added some shading and highlights with Prismacolor pencils. 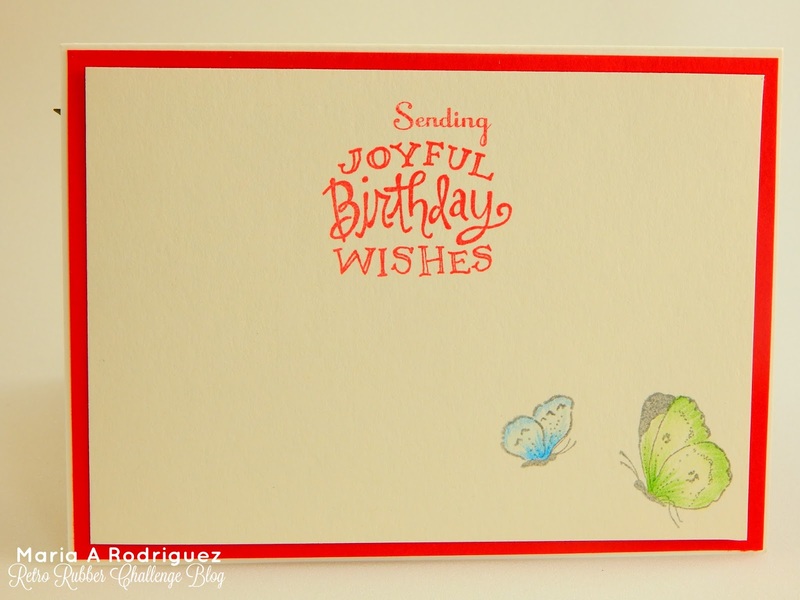 The little Lady Bug was stamped onto red card stock and fussy cut, the flowers on the left were die cut using the Botanical Builder Framelits dies by Stampin' Up! 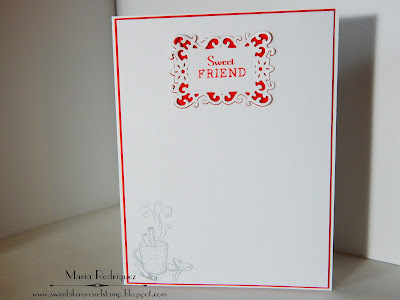 The pattern papers are from a discontinued line from Lili of the Valley, the sentiment is from a Power Poppy set called Simply Camellias and the lace border was punched with a Martha Stewart punch. The sentiment is from a Power Poppy set called Potted Primroses. 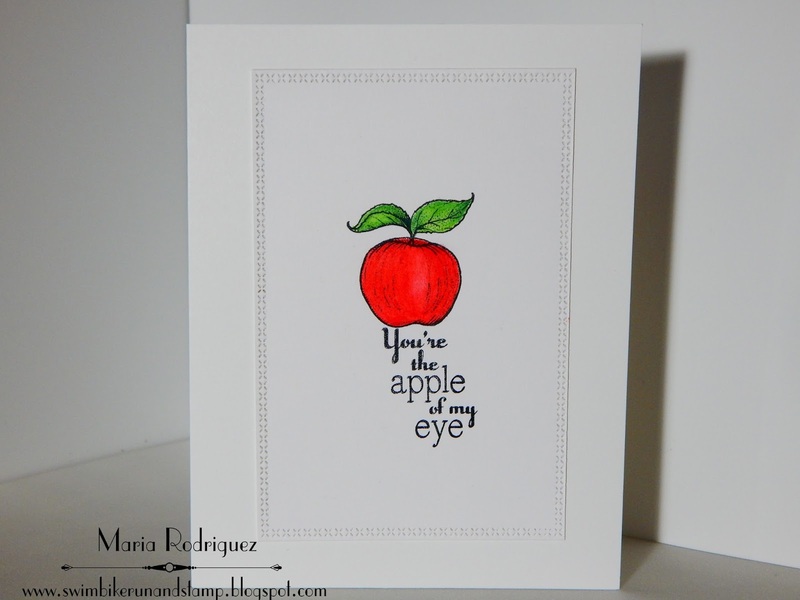 For more inspiration, hop over the RETRO RUBBER challenge blog and take a look at my teammates awesome cards. Please take a minute and read our rules, they are few but important. I hope you join us in gallery, please remember to make sure your stamps are at least one year old, we are all about giving our older sets a chance to shine again. Also, you may enter up to 10 challenges, including ours. Hello everyone: This is not just wishful thinking, February has been an incredibly mild month up here in the Mid West so, I can see some of my bulbs peeking through the dirt, waking up from their Winter nap, soon my Daffodils and Hydrangeas will start blooming, I can't wait. 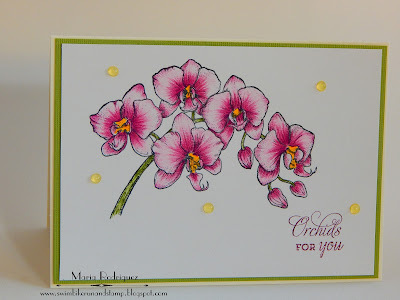 Now, this card I made for the SHOPPING OUR STASH color challenge made me wish I could grow this wonderful flowers, I've seen them at garden centers but I'm always kind of worried this is really not the best climate for them so, I enjoy them only on stamped and colored images like this one, from a retired Flourishes set called "Orchids". I truly love coloring this true to life image, I stamped it with Stazon black ink and did a bit of water coloring and added shading and hopefully, a bit of texture with my Prismacolor pencils. The delicious yellow dots are made with my new NUVO Jewel Drops, they come in all of this gorgeous colors and they dry crystal clear. 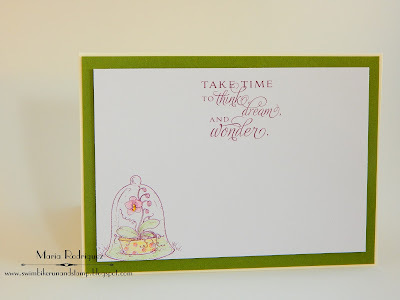 The sentiment is from the same set and the little Orchid in the Terrarium is from a retired Flourishes stamp set. 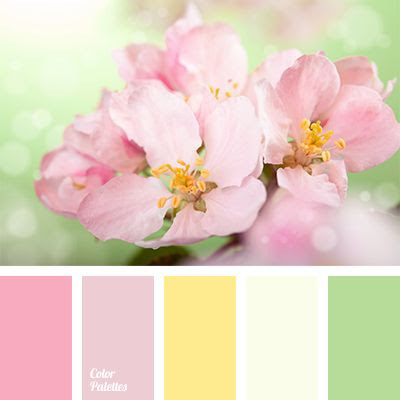 Here is the color chart from SHOPPING OUR STASH, hope you take some inspiration from my card and this beautiful Spring colors. For more inspiration visit the SHOPPING OUR STASH blog and delight in my teammates awesome cards then, hope you join us in the gallery. The time is perfect for you to make a few cards to celebrate Spring, which is really just around the corner.